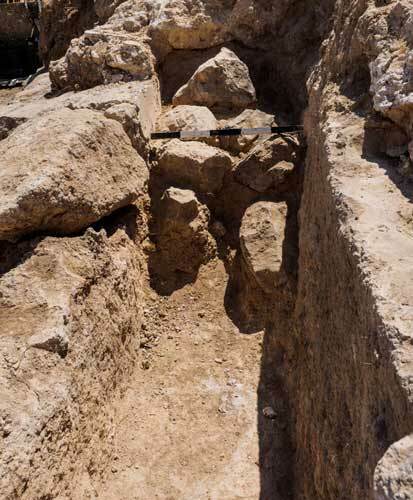 In April–May and August 2015, a salvage excavation was conducted in the Umm Tuba neighborhood of Jerusalem (Permit No. A-7368; map ref. 221446–2080/626243–7121), prior to the installation of infrastructures. The excavation, undertaken on behalf of the Israel Antiquities Authority and financed by the Hagihon Company, was directed by Y. Billig, with the assistance of N. Nehama (administration), D. Tanami (metal detection), A. Peretz (field photography), V. Essman and Y. Shmidov (surveying and drafting), I. Raznitsky (metallurgical laboratory) and R. Kool (numismatics). The lower aqueduct to Jerusalem crosses through the Umm Tuba neighborhood. The aqueduct’s route (length c. 21 km) runs from Solomon’s Pools to the Temple Mount, along a gradient descending from c. 765 m to c. 738 m asl. It was constructed in the Second Temple period, probably during the reign of the Hasmonean dynasty, and was used intermittently until about a century ago. Surveys, inspections and research have been conducted all along the aqueduct (Mazar 1973; 1989:174–177; Billig 1997; Kloner 2000:131, 133–136, 145–146). In addition, several excavations were carried out nearby, along the aqueduct (‘Adawi 2005; Zilberbod 2011; Billig 2014). Much of al-Mashid Street, the main road in the neighborhood, was paved along the route of the aqueduct, and several sections of the aqueduct were exposed during the course of development work along the road. It was possible to conduct an archaeological excavation only on the road’s shoulder (A, below). 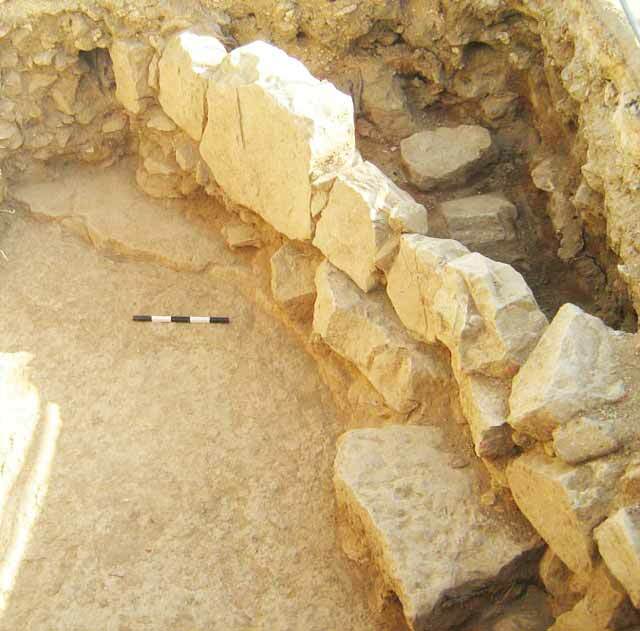 Other excavations were previously conducted in the neighborhood; these yielded remains from several periods (Eirikh-Rose 2007; Kagen and Eirikh-Rose 2012; ‘Adawi 2013; ‘Adawi 2014; ‘Adawi 2015, and see references cited therein). 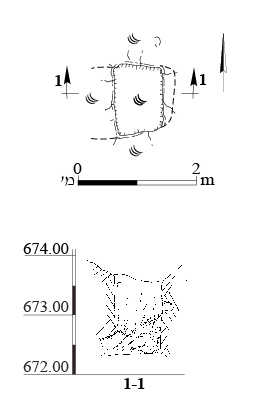 The current excavation was conducted in three areas (A–C; Fig. 1). Area A (al-Mashid Street; map ref. 221445/626785) exposed a section of the lower aqueduct to Jerusalem; Area B (57 al-Sultan Street; map ref. 22171/62668) yielded a rock-hewn installation; and Area C (map ref. 22208/62625), located in the courtyard of an elementary school, yielded a couple of walls. Area A—The Lower Aqueduct to Jerusalem. A section of the aqueduct was exposed along 7.5 m (Figs. 2, 3). Its southern part was almost entirely preserved, whereas the condition of the northern part deteriorates as it nears the road. The aqueduct was mostly built and partly hewn in the limestone bedrock (full width 1.5 m). In the early phases of the conduit, the water flowed inside a plastered channel (specus; upper width 0.55 m, lower width 0.4 m); the channel’s floor was not exposed. The same plaster was found on the sides of the channel and along its rim (width 0.8 m in the west, width 0.3 m in the east, where it was severely damaged). At the beginning of the Ottoman period, a terra-cotta pipe encased in concrete was placed in the bottom part of the channel (the top of the casing was situated 0.60–0.75 m below the top of the channel), thus preventing the exposure of the channel’s floor. Elliptical holes installed in the upper part of the pipe were probably intended to allow workmen to reach inside the pipe and apply a sealant between the pipe sections and/or open blockages in the pipe. 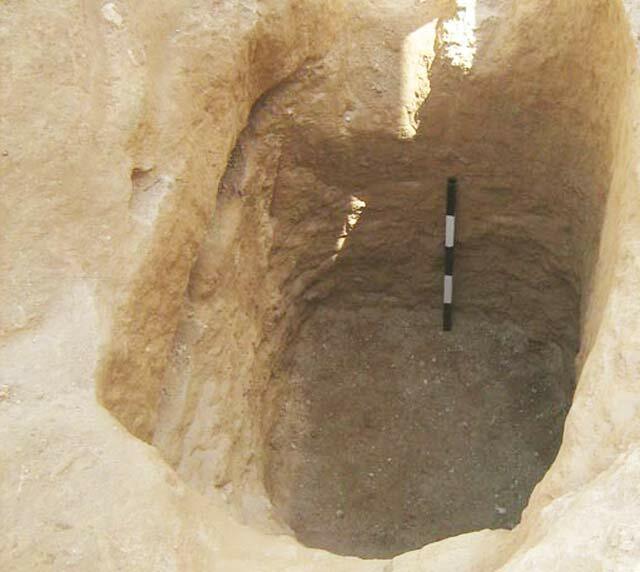 A limestone covering slab (0.26 × 0.45 × 0.65 m) was found in situ at the southern end of the excavation. The water in the terra-cotta pipe flowed at an elevation of 741.8 m asl (as noted, the channel’s floor was not exposed, nor was a section cut through the earlier remains of the aqueduct). A haphazardly constructed vault of fieldstones and cement that was later added on top of the flow channel was discerned on the aqueduct in the southern part of the excavation (Fig. 4). The phenomenon whereby an Ottoman terra-cotta pipe was placed relatively deep in the flow channel, which was then covered with a convex vault of cement and stones, has not been observed elsewhere. Area B—Rock-Hewn Installation. A rectangular shaft (0.8 × 1.1 m; Figs. 5, 6) led to an installation (excavated depth 2.5 m), whose sides, apart from the western one, were vertically hewn. The installation’s western wall was missing at a depth of c. 2 m, and it seems that this was a natural cavity in the bedrock. The excavation was not finished, and therefore the complete plan and purpose of the installation could not be determined. Area C—Wall Remains. Two superimposed walls (W1, W2; Figs. 7, 8) were exposed. The upper one (W1) consisted of large stones set on their narrow side, and its course ran at a slight angle to W2. Wall 2 was built of large stones arranged on their broad side. These walls evidently functioned as field walls during two different periods. Two coins, one from the fourth century CE (IAA 147572) and the other from the Umayyad period following the reform of ‘Abd al-Malik (697–750 CE; IAA 147573), were found in a brown soil fill west of W1. 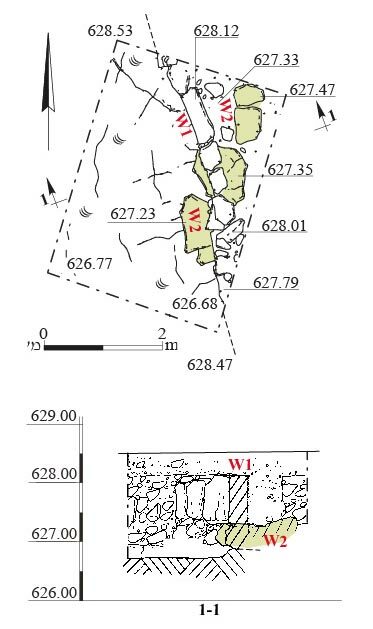 It is possible that the walls were related to a monastery dating from the Byzantine and Umayyad periods, discovered c. 250 m to the west (Eirikh-Rose 2007; ‘Adawi 2014). ʽAdawi Z. 2005. Jerusalem, the Lower Aqueduct. HA-ESI 117. ʽAdawi Z. 2013. Jerusalem, Umm Tuba. HA-ESI 125. ʽAdawi Z. 2014. Jerusalem, Umm Tuba. HA-ESI 126. ʽAdawi Z. 2015. Jerusalem, Umm Tuba. HA-ESI 127. Billig Y. 1997. The Low-Level Aqueduct to Jerusalem. M.A. thesis, Bar Ilan University. Ramat Gan (Hebrew). Billig Y. 2014. Jerusalem, the Lower Aqueduct. HA-ESI 126. Eirikh-Rose A. 2007. Khirbet Umm Tuba. In J. Patrich and D. Amit eds. 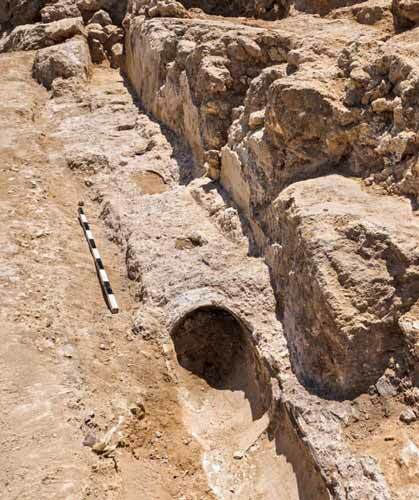 Innovations in the Archaeology of Jerusalem and its Surroundings: Collected Papers 1. Jerusalem. P. 142 (Hebrew). Kagan E.D. and Eirikh-Rose A. 2012. Jerusalem, Umm Tuba. HA-ESI 124. Kloner A. 2000. 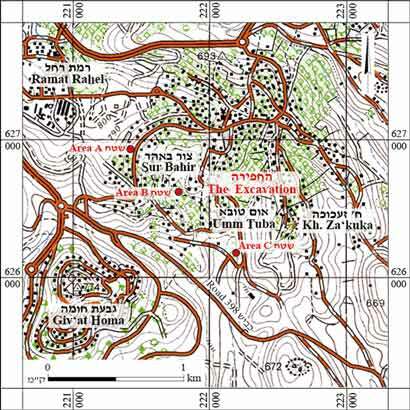 Survey of Jerusalem: The Southern Sector (Archaeological Survey of Israel). Jerusalem. Mazar A. 1973. The Ancient Aqueducts of Jerusalem. Qadmoniot 5:120–124 (Hebrew). Mazar A. 1989. A Survey of the Aqueducts to Jerusalem. In D. Amit, J. Patrich and Y. Hirschfeld eds. The Aqueducts of Israel. Jerusalem. Pp. 169–195 (Hebrew). Zilberbod I. 2011. Jerusalem, Har Homa. HA-ESI 123. 2. Area A, plan and sections. 3. The aqueduct, looking south. 4. Remains of the covering on the aqueduct, looking south. 5. Area B, plan and section. 6. The rock-hewn installation, looking south. 7. Area C, plan and section. 8. Area C, looking north.